The participants on the "Bike Ride Across Texas" gain leadership, organization, and teamwork skills through the planning, preparation, and execution of the project. 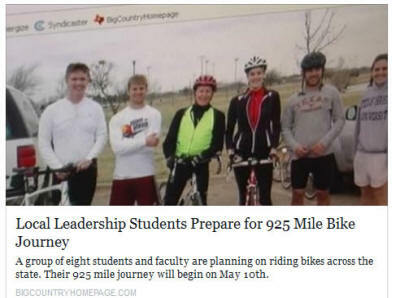 From goal setting, critical thinking, planning, and problem solving to motivation, conflict resolution, awareness of individual differences, supportive communication, teamwork, and project management, the "Bike Ride Across Texas" gives Leadership Studies Program students opportunities to practice and develop leadership and organization skills in a real project. As part of the ride, participants also use the experience to preach the importance of life-long fitness, healthy living, and bicycle safety to people along the 925-mile route. Through newspaper stories, television appearances, and publicity on the ride through our university, we get to tell others that obesity prevention, exercise, and healthy living are important issues for all Texans. Three elementary school presentations in Abilene on our mid-point layover will put us face-to-face with young people--who will hopefully make fitness and exercise regular parts of their lives. We did it! BRAT2 is in the history books and we are now gearing up for another ride the summer of 2015. Time to start training and preparing for the next great adventure. Thanks to all of our supporters for making this a reality. We were also featured in newspaper stories in Premont, Uvalde, Wheeler, Canadian, and Liberal (click to read). 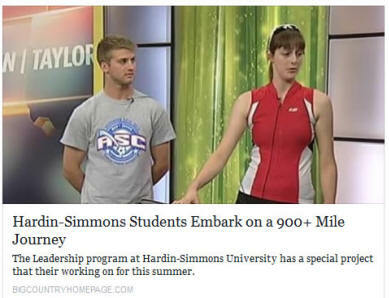 BRAT2 story appearing on the HSU website (5/6/14). 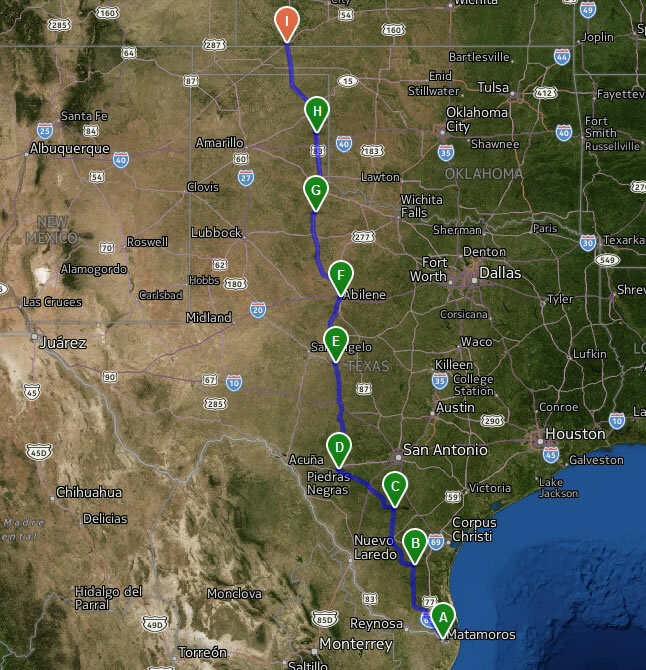 BRAT 2014 route: Brownsville, Premont, Tilden, Uvalde, Eden, Abilene, Paducah, Wheeler, Liberal (Kansas)--925 miles. Special thanks to a wonderfully generous supporter from HSU as well as parents, grandparents, family members, and friends of our riders. 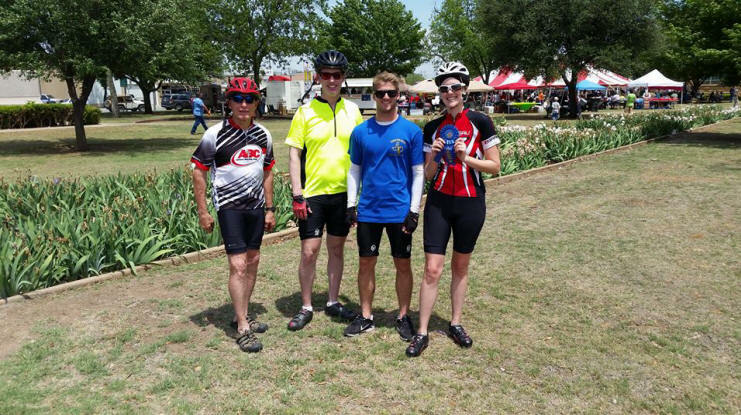 Four of our BRAT2 riders at completion of 60-mile Colorado River Bikefest ride in Ballinger on April 26, 2014. 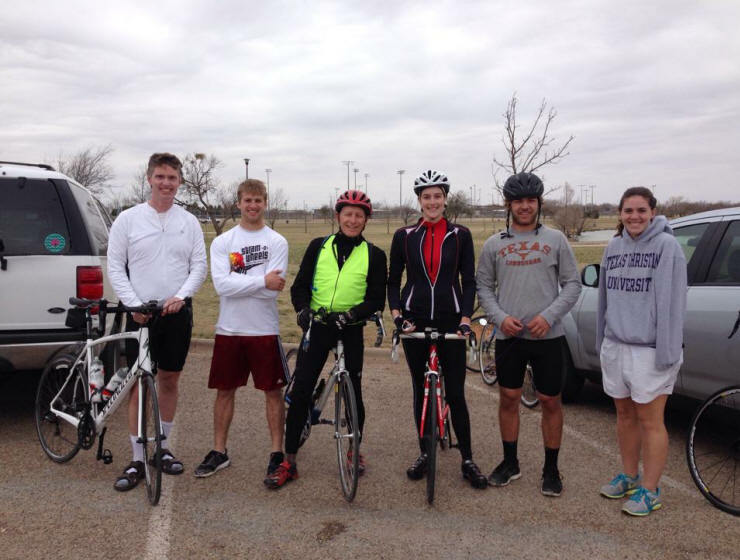 Six of our eight BRAT2 riders at completion of 32-mile Steam-N-Wheels ride in Abilene on March 22, 2014. 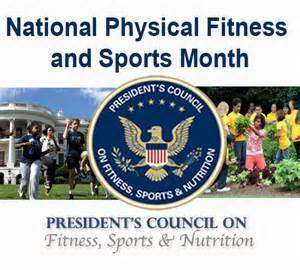 BRAT2 is proud to be an advocate for the President's Challenge--promoting physical fitness, exercise, and healthy living to Texans of all ages. 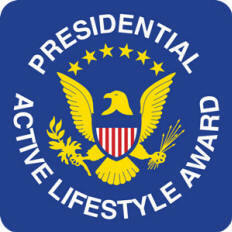 Find an active hobby and make exercise a regular part of your life.